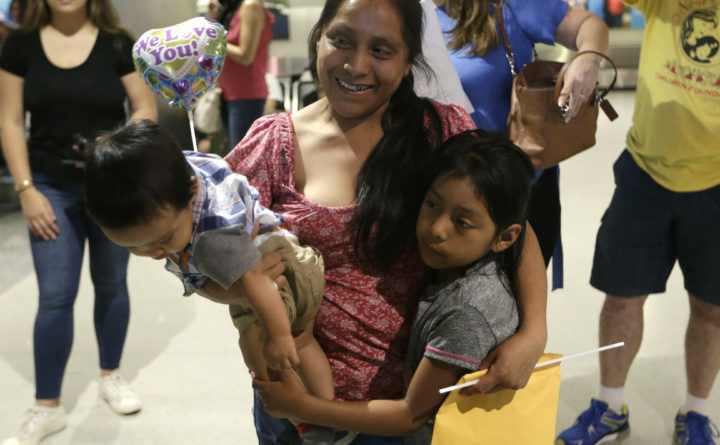 Buena Ventura Martin-Godinez, center, holds her son Pedro, left, as she is reunited with her daughter Janne, right, at Miami International Airport in Miami, July 1, 2018. Public charge laws have been part of U.S. immigration law for more than 100 years. A “public charge” is an individual who’s likely to become dependent on public welfare, and is therefore inadmissible or deportable on public charge grounds. The Trump administration’s expanded list of programs subject to public charge consideration, which would include Medicaid and public housing if finalized, has prompted renewed debate over immigrant welfare usage. Although immigrants aren’t eligible for most welfare programs, both legal and illegal immigrant families can live in public housing, use food stamps, and receive other benefits because their American-born children are eligible as citizens. Immigration has hidden welfare costs. Prominent think tanks generating studies on contentious issues, like immigration impacts, are often financed by organizations with a political agenda. Remember the business-financed think tank studies predicting that NAFTA and China’s entry into the World Trade Organization would reduce America’s trade deficit? Our trade deficits have exploded since then. The fiscal costs of immigration is another hotly contentious issue where big money players have a political stake in shaping public opinion. The National Academy of Sciences — funded by government, not corporate money — has performed two comprehensive studies on the fiscal impacts of immigration in 1997 and 2017. Both studies concluded that first-generation immigrants are costing American taxpayers more than they pay into the system. The current annual fiscal burden from immigrants ranges from a minimum of $43 billion to a maximum of $299 billion, depending on how we treat spending on public goods. For example, do we charge immigrants for the cost of national defense, which the rest of us pay from our taxes? These high and low estimates are based on a variety of scenarios. The 2017 study also examined the second generation. Better educated, as individuals they earn more and pay more taxes than comparably aged natives. However, they and their dependents also generate more public expenditures and remain a fiscal drain relative to native households. Both studies also examined the long-term prospects for immigrants, and made a series of projections based on certain assumptions. The assumptions made in 1997 turned out to be laughably wrong. The old projections assumed that by 2016 Congress would have fixed the entitlement crisis with spending cuts and tax increases. That didn’t happen. And they didn’t anticipate the Great Recession. The 2017 study also took a stab at the future, examining eight different scenarios based on different assumptions. The most positive assumptions project that each immigrant and his or her descendants will produce a fiscal surplus of $279,000 after 75 years. Sounds great. But, under different assumptions, the average immigrant and his or her descendants produces a fiscal deficit of $119,000 after 75 years. Not so great. Where are we headed? Are we recreating the immigration miracle of the 20th century? Or something else. Harvard University economist George Borjas, a member of both the 1997 and 2017 NAS panels, summarized the projection results: “All estimates of the long run fiscal impact are useless.” We can’t predict the future 75 years in advance. With a $22 trillion national debt, all Americans are generating a fiscal burden, not just immigrants. But immigration is a discretionary policy. We could modify the numbers or choose people better prepared to function in a modern economy. Bottom line: Should we enforce public charge laws more strictly, as President Donald Trump wants, restricting access to welfare programs that immigrants clearly need? Or should we reduce the numbers coming in? In the 1920s, Congress severely reduced European immigration, creating labor shortages that drove up wages, empowered unions, brought marginalized workers into the labor force, and produced our middle class. Not a bad outcome. Jonette Christian of Holden is a founder of Mainers for Sensible Immigration Policy.